So by now, you have probably heard about Chick-Fil-A. Chick-Fil-A, for those who are not aware, recently came out openly against gay marriage. Because of this, representatives of the Jim Henson company publicly announced they would no longer supply toys to Chick-Fil-A. 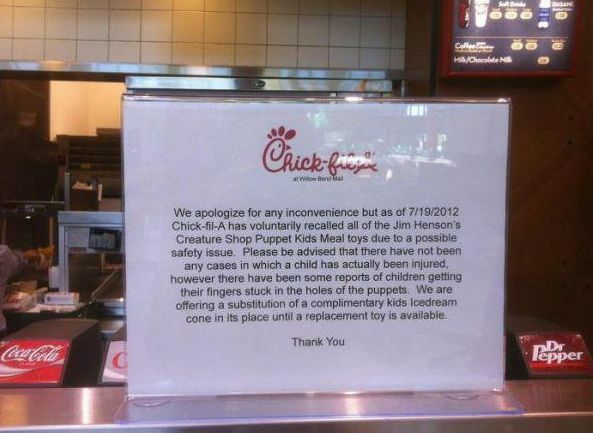 "We apologize for any inconvenience but as of 7/19/2012 Chick-fil-A has voluntarily recalled all of the Jim Henson's Creature Shop Puppet Kids Meal toys due to a possible safety issue. Please be advised that there have not been any cases in which a child has actually been injured, however there have been some reports of children getting their fingers stuck in the holes of the puppets. We are offering a substitution of a complimentary kids Icedream cone in its place until a replacement toy is available." Leviticus 19:11 - "Ye shall not steal, neither deal falsely, neither lie to one another."